No time to read the detailed history? To see a timeline of our church history, click here. 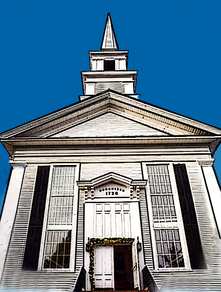 The First Congregational Church of Chatham is as old as Chatham itself, having come into being when, in 1665, William Nickerson, the first settler, brought his family to Monomoyick, as it was then called, built his house and conducted Sabbath services there. The nearest church was in Eastham, was a difficult journey away and although the Monomoyick people contributed to its support, they were not often able to attend services. In 1679 Plymouth Colony Court ordered the inhabitants of Monomoyick “to raise among themselves five pounds a year in money and other substantial goods and deposit it in the hands of some faithful person to be kept in stock towards the enabling of them to build a meeting house or a house for a minister.” It is believed that William Nickerson died somewhere about 1690 and that the first meeting house was built about that time. In 1693, it was voted to “repair the Monomoy Meeting House”. It stood by the roadside just west of Great Hill, on the north side of the road, in that part of the old cemetery where the oldest graves are found. The old cemetery is still there, on both sides of the road, protected by rail fences and kept free of undergrowth. Many of the old gravestones are intact, each one a simple witness to a strong and simple faith. It is said to be one of the great truths of human existence that the future is always rooted in the past; that there can be no movement forward without a starting point. The prophet Isaiah said, “Hearken unto me, ye that follow after righteousness, ye that seek the Lord, look unto the rock whence ye are hewn.” There are more definite records and descriptions of the succeeding meeting houses. The second one was built in 1700. The second meetinghouse, then, was constructed of native timber and of plain boards from the forests of New Hampshire. It was a square building, with its four roofs rising and tapering to a point and looked much like the district schoolhouses of a later date. It was probably not shingled and surely not plastered. Whether glass or oiled paper let in the light is uncertain. Comfort and elegance were not a part of life in that day either in church or at home.The church, like the religious beliefs it upheld, was sturdy and unadorned. Only a year or two after its completion the church was deprived of its first minister by a disaster which cast the little settlement into a state of gloom. On April 30, 1702, Mr. Vickery went out in an open boat with a party of villagers, probably on a fishing or whaling trip. The boat, in some way, was overturned and all were drowned. Mr. Vickery left a widow and seven children, the oldest scarcely of age. Edward Small, the foreman, Nicholas Eldridge and William Cahoon also perished at this time, all leaving large families. Matters particularly concerning the church were arranged by agreement with the parent church at Eastham. In 1720, however, a church council was convened at Chatham on June 15, with ministers and messengers from other churches present and the Chatham Church was formally organized and officered. Fifty-four ministers have served the church since its beginning, many of them, in the early days, from that source of religious training, Harvard University, where most young men desiring to enter the ministry received an education. Mr. William C. Smith, who has written so much about the early days of the church, says, "Few people realize in this day, the large place the minister then filled in the community. He was the only educated man in the place and was relied upon by the straightforward people of those days for all sorts of assistance. "They had so few trained men in those days that they could not afford to throw any of them away. The minister was called upon not only as a physician for spiritual ills, but for physical ills as well. He not only preached on Sunday, but also was called upon to prescribe in sickness, being supposed to have some knowledge of medicine, and he was further expected to know some law. He was oftentimes preacher, pastor, doctor, surgeon, lawyer and judge, all in one. It is difficult to conceive of anyone holding a higher, more responsible or useful position in the community than those early graduates of Harvard College held in these Cape Cod towns in the early part of the eighteenth century." The salary of the first minister, Mr. Jonathan Vickery, was paid in hay, provided by six different men, who promised to bring it to his door. As time went on there were other kinds of remuneration, less goods and more money as ways of life changed. From the beginning the minister was provided with a house and with other necessities of living, but as village and church prospered together these took the form of increasing salaries for the minister. The plain, bare aspect of the meetinghouse, too, began to give way to something a little more comfortable. In 1831 pews were installed in the newly built church. These were sold at public auction February 10, 1831. The sale was satisfactory and no difficulty was found in paying the bills. A new bell was added to the new steeple at this time too, the first in Chatham, and rang for services for more than thirty years. At the time the church was moved to its present location this bell was sent to Boston and recast. It is still calling us to worship today. In the early part of the nineteenth century the unity of the church began to show signs of strain. New forms of belief had crept in and those who allied themselves with Methodist and other persuasions were no longer willing to support the old church. First to establish themselves were the Methodists in 1816, followed by the Universalists in 1822 and the Baptists in 1824. During the pastorate of Mr. Stetson Raymond, the opposition to the regular church had grown so strong that it was found to be impossible to continue it longer as an institution supported by the town. The town records show that, at a town meeting held August 9, 1824, "the town voted not to raise $500 for Mr. Stetson Raymond. Then the hearers of Mr. Raymond voted to raise $500 for his support this year." This ended the connection of the town as such with the church. The members of the church then met and organized themselves into the First Congregational Parish of Chatham on October 18, 1824. In 1729 the meetinghouse was enlarged and, with additions, served the congregation for nearly a century. When at last it was torn down, it was sold at public auction and parts of it distributed to various parts of the town. In 1830 the present building was erected on land now known as the Union cemetery and which was used by the Congregational parish and others as such. The cost was $2,920.77. This same building was remodeled and moved to its present location in 1866 and is the one in which we now worship. The cost was $8,000, which was raised by subscription. A new parish house was added to the church in 1961, providing a minister’s study, Sunday school rooms, church parlor with adjoining kitchen, a library and other facilities. Church and town stood together from the days of Chatham’s first settlement. In 1967 the sanctuary was altered and an elevator installed to make the sanctuary more easily accessible from the ground level. A Memorial Garden was planted at this time, too, against the parish house wall. The chandelier in the sanctuary has hung there since 1848 when the church expanded to accommodate increasing members who wished to buy pews. This involved an expense of about $1,200. The sale of pews provided for the alterations and sufficient money was left to purchase the chandelier, new lamps, and carpets for the aisles. The little lamps of the chandelier burned whale oil and could be drawn down for filling and lighting. 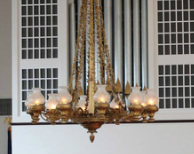 When, in course of time, the church was wired for electricity, the chandelier was wired also and firmly fixed in place. Upon the advice of those who recognized its unique quality as an antique, no other changes were made in it. To do so would have destroyed much of its value and interest. On July 16, 1887, lightning struck and damaged the steeple so severely that the church was deprived of it for a time. It had been a landmark for ships at sea during all the years of its life and the urging of the lifesaving station added to the wish of the congregation that it be put back again. David Edwards restored it, using for the new ornament at the top of the spire a part of the mast of the barque R. A. Allen, wrecked on Monomoy at that time. The church became affiliated with the United Church of Christ in 1961. Since then Chatham people have increased and so have the number and variety of Chatham churches. Our own church is served through many channels, each one vital to the whole. There are, in addition to the Trustees and Deacons, the Sunday School, Missions and Ministry of Music, and last and most important, our minister, Rev. Joseph Marchio, guiding and counseling us all. We cherish a two hundred and eighty-year old tradition and look forward, with bright hopes, to a future which will copy fair our past.